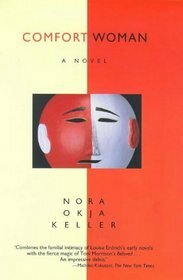 I have just finished Comfort Woman by Nora Okja Keller (1998), a debut novel following the story of an adult daughter of a Korean immigrant wife and her white US missionary husband who now live in Hawaii. The book flips back and forth between the daughter’s present time PoV and the mother’s (now dead) PoV and the cultural/generational clashes that arise between them. The mother can see spirits and goes into trances – a gift that she believes she was given after having suffered as a “comfort woman” to the Japanese troops when they invaded Korea. I also liked learning about the various beliefs and customs for some of the villages in Korea – fascinating. The story is set in Hawaii (where I am going in December and have never been before) – so I was interested in the descriptions of the lush flora etc. (Big contrast to West Texas especially now when we’re wilting from the long dry summer.) A few rain drops would be appreciated here – from the book’s descriptions, it sounds like Hawaii gets enough precipitation every day! This entry was posted in Uncategorized and tagged American, Fiction, gender roles, history, women by lizipaulk. Bookmark the permalink.